If your a regular reader, you've certainly heard me rant and rave about my LOVE of all thing's Starbucks before! Though I had never had a chance to try their VIA® varieties, I was excited to see what it's all about and if it had the true robust flavoring that makes Starbucks, well, Starbucks. Emptying a packet of VIA® into a glass of cold water, I thought to myself; this really can't taste as good as a fresh brewed iced coffee from my favorite corner Starbucks...can it? I stirred, added some cream, a few ice cubes ( It literally takes seconds to make a glass of Starbucks VIA® iced coffee), and took a sip. YES! VIA® tastes just as great as the iced coffee that you can get at your local Starbucks coffee house! Now you can experience your favorite iced coffee wherever.....whenever! When I'm on the go I can pop a packet of VIA® in my purse, and experience a yummy Starbucks iced coffee and all it's goodness wherever I may be! You can find Starbucks VIA® Iced Coffee at your local Starbucks coffeehouse, and select retailer's. 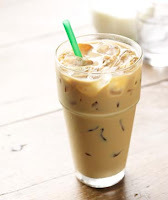 Want to experience Starbucks VIA® Iced Coffee for yourself? One lucky reader will receive two boxes of Starbucks VIA® Iced Coffee! Leave a comment~Which delicious Starbucks Coffee is your favorite? The comment is considered your entry. Entry to this giveaway ends at 12pm PST August 14, 2010. Winner's are chosen randomly through random.org. The winner will be announced in a post within 7 days of the giveaway ending, and contacted through email. The winner will have 48 hrs. to respond or another winner will be chosen. I like Starbucks RED--East African Blend. Thanks! I like the expresso roast! I love the Starbucks Natural Infusion -- Cinnamon flavor.. MMM!! I love everything and anything cinnamon! I like the Mocha Light BLENDED Frapp the best! I like the 3 Region Blend. My fave will always be the espresso roast! I love their French Roast, it's dark, bold, and amazing for waking me up in the morning! I always order an iced latte at the store but at home I brew breakfast blend. It has been forever since I have ever had a Starbucks coffee. I am sure I would love any of them. Hope this counts as my entry. Gotta love the White Mocha Frap! I like the House Blend. I like Starbucks Vienna coffee. Like" Starbucks on FACEBOOK@tcarolinep JessieKatie S.
The caramel macchiato is my favorite!